He’s gone. I knew it would happen soon after he lost his wife a few months ago. But it’s still hard to believe he’s actually gone, the man who’s been singing to me since before I can remember. Oh Pete. I feel like a member of my family has died. Another really beautiful chapter. I love the bond that the members of the Fellowship have formed. I’ve been wanting to re-watch Next Gen, since i haven’t seen it since it originally aired, pretty much, and I have memories of it being pretty good (some of the time). I started with Season 1 a while back and found it next to unwatchable. So I asked around on the internet and among friends and relations: when does Next Gen get GOOD? The consensus seems to be “season three”. So I watched the first ep of season 3 a couple months ago, and Henry and I watched the second ep last night. Hmm. Stiff, clunky, poorly-written to an almost unbelievable extent, boring camera work, and I think that instead of auditioning actors for supporting roles, they just grabbed random people off the street and handed them a script. It was “Lost Skeleton of Cadavra” bad. Hilarious. So then we watched an ep of TOS and, by comparison, it was a Shakespeare play performed by fine actors and filmed by a genius. Episode: “The Galileo Seven”. The cinematography was interesting! The story was compelling! The actors ACTED! The sets, though simple, were attractive. Even the music was appealing. Sure, the “Spock is a Vulcan and has no emotions — but wait! When the chips are down, he’s as human as anyone!” angle was perhaps overplayed… but you’ve got to remember that when it originally aired that was a new story and not yet part of our cultural language. I’ll keep slogging through Next Gen. I KNOW there are some good episodes in there somewhere. But thank goodness I’ll always have TOS to fall back on when I need that “Star Trek” feeling in my soul. Aragorn, Legolas, and Gimli meet up with someone in Fangorn Forest. I loved recording this chapter. I think it’s extra-beautiful, and I especially like the bit about being “dangerous”! Pippin and Merry among the Ents. In two parts, ’cause it’s a long one. Yes, Quickbeam’s song about the rowan trees got me all choked up. Who’s the best guy at making up names ever? Tolkien, that’s who. Boy, there have sure been a lot of good movies recently. In the past few weeks I’ve seen “Nebraska”, “Dallas Buyers Club”, “Her”, and “La Grande Bellezza”, all of which were REALLY good. It’s hard to pick a favorite among those four, but “Her” probably touched me the most. All were well-crafted stories about humans (and one OS) interacting with each other, pretty much. My favorite kind of movie. Action, adventure, comedy, or thriller movies can be great, but the movies I like the most are always the ones about all the wonderfully varied ways that people behave and interact. I still want to see “Inside Llewyn Davis” and “American Hustle” before they disappear! Beautiful cover of a beautiful song, with a beautiful video. Pippin and Merry are in the hands of the fightin’ Uruk-Hai! Oh no! A few weeks ago my brother tweeted something about some Lord of the Rings lectures online. I hit the link, naturally, and discovered Dr. Corey Olsen, The Tolkien Professor (@tolkienprof on twitter). I downloaded and listened to his lectures on The Hobbit and was hooked after only a few minutes. He knows his stuff, and obviously loves and understands Tolkien, and puts things so clearly. His lectures are a joy. I wish Dad could have heard them. Henry and I are both enrolled in his new course on Tolkien’s Unfinished Tales, which neither of us has read before. Woohoo! 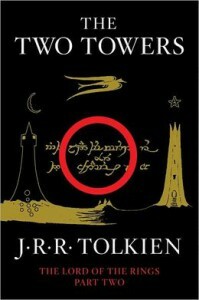 I got started on The Two Towers this morning, and read the first two chapters! One is short (20 minutes) and once is very long (over an hour). I haven’t read The Two Towers since probably the early 2000s, when I read it to Henry! So, though I remember what happens generally, it’s lovely to get all the details again. Henry and I had a little film festival today. We started with Vertigo, ’cause he’d never seen it, and then finished up with some old favorites: O Brother Where Art Thou, and The Lost Skeleton of Cadavra. Fun. I’ve been feeling good all week! I think I’m finally finished with the killer November virus, plus I’ve been really hard-core about my sleep hygiene: no screens except for my Kindle once I’m tucked in bed, and an alarm set for the same time every morning. And when my alarm goes off (The Goldberg Variations, of course) I actually GET UP and go out to the kitchen and eat something right away before my brain can come up with a whole lot of things to do that are more fun than eating. Henry discovered a two-man Settlers of Catan variation that is super-fun! We just played twice. It feels _almost_ like playing real Settlers. To sum up: remove 5 land tiles, several Dev cards, a couple of number chips, and a few of each player’s pieces. You may trade only with the bank (4:1) until you get a harbor. Uh. Flickr is adding crap on top of my photo when you mouseover. Revolting. Time to find another photo host. You can find the whole book on my “kayray reads to you” page. The rest of the Melendy Quartet is there too: The Saturdays, The Four Story Mistake, and Then There Were Five. If you’d like to read another book about kids on a treasure hunt, try to find “Go to the Room of the Eyes”, by Betty K. Erwin. It’s out of print, naturally, but maybe your library has it. I wonder if Mrs. Oliphant’s house was designed by Frank Lloyd Wright? It sounds like his kind of house, doesn’t it? My plans to visit a friend today fell through so instead I stayed home, did one recording, and un-decked the halls and un-trimmed the tree, which is a job I actually enjoy. I listened to my non-Christmas music library on shuffle (there were some wild juxtapositions, let me tell you) and, through careful and efficient packing, I managed to condense our four boxes of Christmas stuff down to only three. It was a triumph, I tell you! There are only two more chapters of Spiderweb and then that’s the very end of the Melendy books, alas. But then I’ll get started on my Big Project for 2014 which will be, by popular request… drumroll… The Two Towers and The Return of the King. Call me crazy, but I think I can do it if I can avoid being taken down by any more two-month viruses!